Callie Reed pays a long overdue visit to her aunt, Melodie, at her fairy-tale cottage in quaint Keepsake Cove, which is home to a bevy of collectible shops on Maryland's Eastern Shore. Just as they're beginning to reconnect, Callie discovers her aunt's body on the floor of the music box shop she owns. Grief-stricken, Callie finds she can't accept Melodie's death being ruled accidental. How could her strong and healthy aunt take such a fatal fall? And why was she in the shop in the middle of the night? First book in A Keepsake Cove Mystery series! 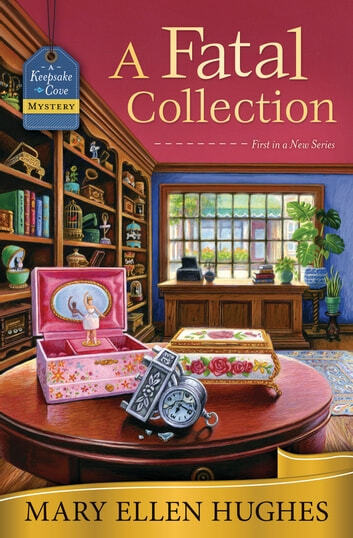 A Fatal Collection by Mary Ellen Hughes is the first book in A Keepsake Cove Mystery series. Callie Reed is visiting her Aunt Melodie in Keepsake Cove, Maryland. Melodie owns House of Melody, a music box shop and lives in an adorable red cottage behind the shop. The next morning, Callie goes looking for Melodie and finds her dead in the shop. The police rule it an accidental death, but Callie is not so sure. After the funeral, Callie discovers that she inherited the shop and cottage. It is the perfect time for a change, and Callie embraces her new life. When Callie goes through her aunt’s belongings, she finds a second disposable cell phone. Why did Melodie need a second phone? Then someone tries to break into the shop. What are they after and why is Grandpa Reed’s music box playing on its own? Questions are piling up and Callie wants answers. A Fatal Collection is nicely written, great main character, and it had a nice pace. I enjoyed the descriptions of the various collectible shops in Keepsake Cove (unique town). Mary Ellen Hughes created some good characters in a quaint tourist town. I wish, though, that she had developed the main character a little more. We are not given enough background on Callie. I am hopeful the author will rectify it in the next book. Readers are introduced to many of the shop owners. I did tire of the numerous clothing descriptions of Callie’s part-time employee (she has an unusual clothing style). The investigation is minimal and the killer easily identified. I wish Ms. Hughes had made the mystery more enticing. I felt the flirting and romance between Callie and Brian Greer inappropriate since Callie has just left her husband (I could have done with less of him too). I did enjoy the paranormal element and I hope there will be more of it in future books in A Keepsake Cover Mystery series (with a better explanation). A Fatal Collection is a cute start to the series. With a few tweaks, it could be a delightful cozy mystery series. I was taken back to yesteryear and all the fun shops and quaint little towns that I visited in an around Colorado. I loved the quaint village of Keepsake. It did almost feel like a Hallmark town. The collection of shops and colorful characters sweep you in and make you want to stay. The story was fairly fast paced for me and an easy read. I couldn't help but feel sorry for Callie. Having her aunt die just as she comes to town. And then realizing that it was no accident. Callie finds the answers and is set up to be the new sleuth on the block at least in Keepsake Cove. A Fatal Collection is book 1 of a great new series. I am looking forward to more adventures in Keepsake. I received a complimentary copy from Great Escapes Tours.